1. Double-tap the Home button, your recent app tray should pop up from the bottom. 2. Locate the Safari icon, tap and hold the icon until it wiggles. Tap the red spot and press the Home button again. 3. Now restart the Safari app and check your bookmarks folder, you may find your lost bookmarks back. Note: Please don’t sync your iPhone or iPad with iTunes after you lost your Safari bookmarks, or the iTunes will update the backup to be the same as the current data on your iDevice, and you won’t restore Safari bookmarks from iPhone backup any more. 1. Run the freeware, it will show all iTunes backup files stored on this computer. Select the one you need. 2. Choose “Safari Bookmarks” and click “Start Scan”, the program will scan the iTunes backup file for lost bookmarks. 3. 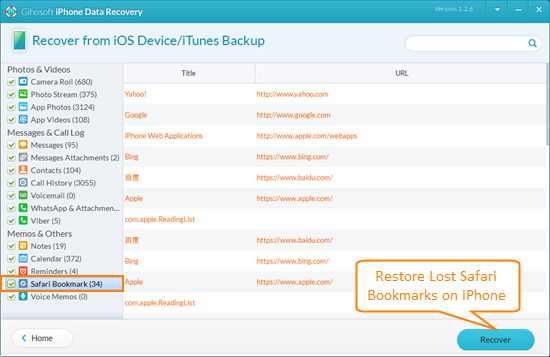 Preview bookmarks in details and select items you need, then click “Recover” to recover deleted iPhone Safari bookmarks. And that is all! You now have your deleted bookmarks back! 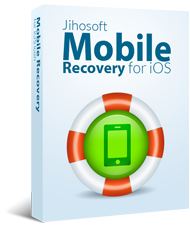 If you haven’t made an iTunes backup, take it easy, you can use iPhone Recovery Software to directly scan and recover deleted Safari bookmarks from iPhone or iPad before it’s overwritten by new data.